Roman Ways. 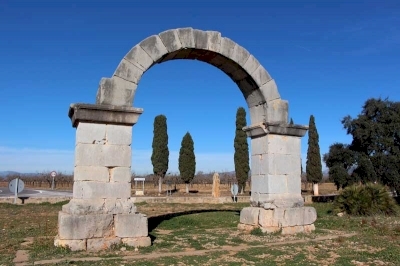 Itineraries of the Roman Empire is part of the Tentative list of Spain in order to qualify for inclusion in the World Heritage List. 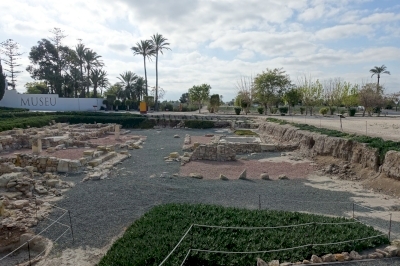 A few kilometers South of Elche lies the archaeological area named L’Alcudia. Alcudia is the Moorish name of the hill where the original Roman colony named Ilici was situated. The site was settled already in pre-Roman times and grew under the Romans as it was designated as Colonia Iulia Ilici Augusta. Veteran soldiers of Augustus campaigns settled here. After the Roman period the Visigoths and the Byzantines controlled the town. Consequently, there are some paleo-Christian ruins on the site. After the Moors took over, they set up a separate town further north (modern day Elche) and the original town was mostly disbanded over time. While the site does not hold any spectacular ruins, the onsite museums are quite nice and provide much needed background. The most notable find on display is a copy of the Lady of Elche, a pre-Roman bust with a very distinctive hairdo. The original is shown in Madrid. By spanning so many periods the site enriches the history of nearby Elche, so I enjoyed visiting. Having only seen Alcudia I can't fully judge the nomination. Alcudia certainly has regional and potentially national significance but no OUV. If Alcudia is representative of the whole, then this is an assortment of mediocre Roman ruins. The goal here is to create OUV by finding strength in numbers; I hope this fails. In Tarragona there is already a similar site from the same region inscribed which also happened to be part of the Roman road network in question. I walked from downtown Elche to L’Alcudia by foot. It’s not really a pleasant walk. You may be better served taking a cab. On my way back, I followed the river bed, a small detour. Obviously, you should visit Elche. The region also holds some rock art. Plenty of places in Spain are named Alcudia. The name derives from the Arabic Al-Qudya: the hill. I visited 2 components of this site. The nomination is focused on the Via Augusta but contrary to other routes, like the Camino Real in Mexico or the Routes to Santiago, they are mostly talking about the street itself and not the stations in between. Too bad basically none of the street is left. I visited Sagunt, around 25mins from Valencia. In itself a town of historical significance, as it was an important Roman town and it was conquered by Hannibal on his way to Rome. The fortress (built by the Romans and extended by the Moors) is massive and visible from far away. Not too much of the Roman infrastructure is left though. Same goes for the Roman Theatre next to the fortress that has been heavily desecrated with modern infrastructure in order to keep using it as a theatre. It’s a shame, compared to the theatres I saw in Orange, Mérida or Dougga. All in all a nice enough town for a stop, but not especially for the Roman sites. The second component I visited was the Arc de Cabanes. It is a triumphal arc in the size of the bigger door. The fact that they built a road around the arc makes it appear rather like a nice roundabout decoration than an actual archaeological site. At least there is an information panel about the Via Augusta close to the arch. There might be more interesting components of this TWHS, but from what I saw it looked like the attempt to gather several mediocre sites and make one WHS out of it.